The purpose of this conference was to reflect on the fundamental values guiding sisters who lived under communism and to explore ways in which those values can be integrated into our lives as members of religious congregations today.Rev. Dr. Borys Gudziak, Rector of the Ukrainian Catholic University, Lviv, in his opening address focused his remarks around three areas: history of the persecuted Greek Catholic church; how that history has been recorded; and his personal thoughts and hypothesis about female religious relative to the underground church. If we want a paschal sacrifice today of young generations, we need to honor sacrifices of those who lived under communism. We do not have the right not to preserve this unique document in the historical record. We need to create a record outside of people’s memories. It is dangerous to reject the past that has such profound lessons. The modality of witness, despite what the world says, is what underground life teaches us. Dr. Gemma Simmonds, Congregation of Jesus, Lecturer in Theology, Heythrop College, University of London, England gave three major presentations; Our Common Mission and Commitment, Witnessing Faith and Transformation of Hope. I believe that the heart of religious life, of our Common Mission and Commitment, lies in the Eucharistic meal shared by Jesus and His disciples on the night before He died… I believe that the words ‘this is my body’ and ‘do this in memory of me’ apply to religious life in a very specific way that gives to all our experiences, East and West, old and young, a core of common value and meaning. The experience of communist oppression broke many of the sisters in body, mind and heart but it did not break their sense of common commitment. 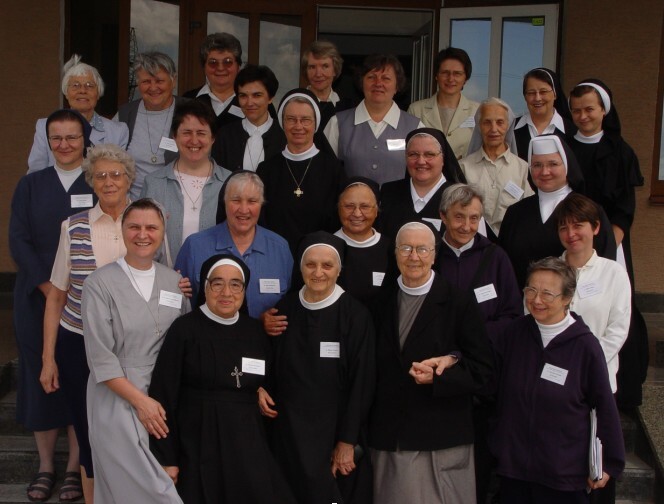 We see how those lives chosen and consecrated by God, broken by suffering, were given to others, both those to whom the sisters ministered and those who came after them in religious consecration. Our common mission and commitment requires us to recognize in each human face the face of Christ and especially in each fellow religious, a person who has received the same call to intimacy. God is God of the present and future as well as the past. We do not cling to the memories or even the graces of the past as a comfort blanket, but we ask for the courage to face the truths of the present. We ask for a radical conversion from the effects of the years of communist dictatorship with its double standards. The goal of Christian life is not enlightenment but wholeness and integration. We need to live religious life Eucharistically; to look to ourselves, others and all creation and say: ‘This is my body, chosen, blessed, broken and shared,’ as we reach out with a touch of healing and do it in memory of Christ. The hardships of the past were clear and we endured them. We are now experiencing the slavery of freedom. We are called, as T.S.Eliot says, to a condition of complete simplicity costing not less than everything. Blessed are they who plant the seeds of hope and courage in the heart of others. We live in the paradox of which St. Paul speaks in Cor. 1:27:30 that it is precisely in the failure and collapse of our hopes, of our systems of security that we experience the power of the Spirit who calls us to life in transformative hope. Human life is characterized by conflict and tragedy; however through the witness of faith our lives can become a revelation, not of the hopelessness of the human condition, but of the hope that is to be uncovered in tragedy. The past was not more difficult than the present; then the enemy was clearly visible. Now the enemy is less obvious and more easily mistaken for good. Two major lessons from the hidden experience of sisters under communism are the power of silence which enable contemplation to flourish and visibility which provides a living sign that others are able in some way to interpret.